SICULO-PUNIC, "Camp of Melkart", (c.330-305 B.C. 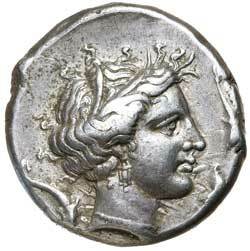 ), silver tetradrachm, (17.24 g), obv. 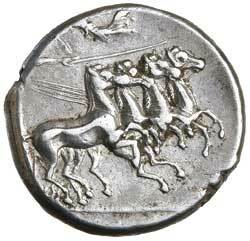 charioteer driving a quadriga of rearing horses to right, holding kentron in right hand, reins in left hand, Nike flying above and crowning charioteer, Punic legend ['RSMLQRT'] in exergue, rev. wreathed head of Persephone to right wearing triple-pendant earring and necklace, four dolphins around, (S.-, Jenkins, SNR 50, 49 [same dies, dies 018/R31], BMC 15 [same dies], SNG Lloyd 1601 [same obverse die], Boston 269 [same reverse die]). Light grey tone, good very fine, well centred, very attractive and rare. Ex Noble Numismatics Sale 112, (lot 3749). Previously Status Auctions, Sydney, Sale 183 (lot 2080) and Noble Numismatics Sale 64 (lot 2421). Jenkins records only four examples of this coin struck from these dies with only one noted as available to collectors.